Special Summon 1 Fusion Monster from your Extra Deck that lists exactly 2 monsters as material, including “Elemental HERO Neos”, by sending those monsters from your hand, Deck, or field, ignoring its Summoning conditions. For the rest of this turn after this card resolves, you cannot Special Summon monsters. If a Fusion Monster(s) you control that lists “Elemental HERO Neos” as material would be destroyed by battle or card effect, or shuffled into the Extra Deck by its own effect, you can banish this card from your GY instead. Ratings are based on a 1 to 5 scale. 1 is awful. 3 is average. 5 is excellent. Neos Fusion adds itself to the long list of “Fusion” Spell family members. Ten monsters to choose from when using Neos Fusion. Requiring exactly two with one having “Elemental HERO Neos in the text for materials prevents abusing this card to get a huge Neos beater/board breaker out easily, which is balanced. Hand, deck or field sending to the grave is great, giving you that added deck thin ability. Locking you out of Special Summoning after that is fair, considering you are ignoring any summoning conditions for the Fusion monster. Do all your Special Summons before using Neos Fusion, not hard. This cards best effect may be its second effect though. Protection against destruction AND preventing a recycling of the Neos Fusion monster back into the Extra Deck by simply removing this card, this is what they needed when first released. Getting these monsters out on the field wasn’t enough if they weren’t going to win you the game, as they were getting recycled into the Extra Deck at the end of the turn. Out of the ten available for this card, only three don’t recycle themselves. Many of them have great effects that you’d like two turns to activate them, and Rainbow Neos has a huge effect that can devastate your opponent. For those who play this fun archetype, this is a card to run in 3’s. Neos Fusion comes at us with no cost to activate but no more Special Summons after this card resolves. So, after you have done any other Special Summoning, activate this to Special Summon a Fusion Monster that lists 2 materials including Elemental Hero Neos. The materials for said Special Summon can come from your hand, field, or deck. Being able to go from the deck is why this card needed balancing. There is a second effect where Neos Fusion banishes itself from the grave instead of letting one of your Fusion Monsters that lists Elemental Hero Neos be destroyed by anything, or be shuffled back by its own effect. It should have just said shuffled back by any effect, but again balance for strength. Fortunately, the grave effect is not once per turn, so if you have multiple in there, you can save your monster a few times. The deck itself will always be casual because of the resource costs, but Neos Fusion is a much better way to do what the deck wants to do. The card’s score reflects its power. Score: 4.25/5 Art: 4.5/5 Neos stands for not even one swirl. 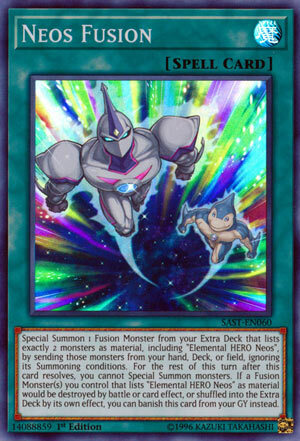 Next up for Neo-Spacian/Neos week, we got a card to make summoning the Fusions much easier, Neos Fusion. Neos Fusion is a Normal Spell that upon activation lets you Special Summon a Fusion from the Extra Deck that lists exactly 2 monsters as material, one of which being Elemental HERO Neos, by sending those Fusion Materials from the hand, deck, or field to the graveyard, ignoring the summoning conditions of the monster. I guess they didn’t want you summoning the Triple Contact Fusions with greater ease with this, because those are pretty good besides Chaos Neos arguably. You got some good options like Aqua Neos to get rid of a card in the opponent’s hand, Air Neos for easy OTKs, Dark Neos for small negation, Grand Neos for bouncing, and Rainbow Neos, which is still an amazing card by 2019’s standards. Tomorrow we’ll look at another Fusion, so I won’t mention it here. This is great for getting those Contact Fusions out without having to summon the monsters and put them back in the deck and it helps set up Miracle Contact for later once the Fusion, beyond Rainbow Neos and the new card, goes back to the Extra Deck. Speaking of that, if a Fusion that lists Elemental HERO Neos as material would go back to the Extra Deck via its own effect or if it would be destroyed by battle or card effect, you can banish this from the graveyard instead. Preventing the bouncing effects will be great for the Triple Contact Fusions as they have effects that clear the field upon going back to the Extra Deck, and that’ll be nice to do on the opponent’s turn, but the regular Contact Fusions might only be good to keep a body on the field for the opponent’s turn before they go back to the Extra Deck anyways, so the best use of this is preventing the smaller Fusions from being destroyed. Neos Fusion makes summoning the Fusions with ease without taking the minus from Contact Fusing since it could use the deck. I should mention that using this for a Fusion Summon locks you from Special Summoning at all for the rest of the turn, but you can get around that by making plays before using this. If you play the Neos deck, this is a three of without hesitation. Art: 4.5/5 Glad they weren’t lazy and did a swirl, love Neos and Aqua Dolphin going through Neo Space. It wouldn’t be Neos week without talking about Fusion, now would it? Neos Fusion is a Normal Magic card (with a LOT of text on it). Special Summon a Fusion Monster from the Extra Deck that lists Neos as Fusion Material and one other Monster. This immediately knocks out the Triple Contact Fusions, and while I dislike that, it’s necessary. Those guys are beasts, and dumping one Magic card for one of them…no. Monsters for the Fusion you choose can be sent to the Graveyard from the Hand, Deck, or Field (not and/or, just or) and choice is good, and the clause not being and/or helps add a little balance to this card too. You are, furthermore, prevented from ANY Special Summons for the rest of the turn, after resolution of this card. I guess to prevent swarm of big boss Hero Fusions, which I’m still not liking, but feel is appropriate. The money effect here is the final one, in my opinion. If a Fusion Monster with Neos listed as material would be cycled back to the Deck via its effect, or destroyed by Battle, OR further, by card effect, said Fusion is protected from the effect in question by removing this card from play from the Graveyard instead. That’s a wonderful effect, and you’re likely going to need it eventually. This is a GREAT card. Anything to assist the speed of Fusion Summon for Heroes is a plus, the protection is great, and you’re using 3 of this in the Deck, period. Art: 4.5/5 This is a Fusion picture without swirls…although one could argue that Neos and Aqua Dolphin are swirling to begin a Fusion, so I’m going to say that. Neos Space is pretty too. Visit the Card of the Day Archive! Click here to read over 4,000 more Yu-Gi-Oh! Cards of the Day!